I wrote a blog post a while back about all the things you should gather before you start potty training but never actually wrote about the method I used to potty train my then 1-year old son. So here it is, finally. I knew I did not want to potty train him for months so any part-time method was out of the window, I wanted to be done in a matter of days. Less confusion for him, and less headache for mommy. So I searched through some potty training books online and eventually decided to get this Potty Train in Three Days book. Please save your money and don’t buy it, it is useless. Although there are some very helpful tips, some are just plain ridiculous and no matter how hard the book tries, it’s an old-school book with the 80’s approach to parenting which does no appeal to me. Expect to stay indoors for up to one week (lucky you, if you have a back yard). All depends on your child, some will get it in 2 days, some need more time. You might have to take 3-5 days off if you work. You will have to fully dedicate your time and energy to potty training. Prepare yourself mentally, stock up on potty training supplies and liquor. Prepare your child upfront for his/her big day – be excited for the big day, even have a potty around the house so they can get used to seeing it, get undies with their favorite character to get them excited too. My son was just 1.5 when we started so this did not work since he had no preference then, but now I would be frantically searching for The Fresh Beat Band undies. Stop using diapers/disposable training pants at once and never use them again, ever. Not even for naps or night time. Remember, until the potty training day, they only knew one thing and that is to release their waste into their pants. Once you introduce potty training, you are trying to break this habit and tell them to use a potty and not to release into their paints. If you give them a pull-up diaper for outings, you are only sending them a confusing message as you are suddenly telling them “it’s ok to pee into your pants now”. Although it may be more convenient for you to put a pull-up diaper on your child and avoid dealing with potty training outside, this confuses the child and drastically slows down the potty training process. You can use cloth training pants for outings or bed time – they don’t hold much, just one pee. The whole point is that your child feels he/she is wet and is bothered by it. As for naps and night times – apparently, children don’t pee in their sleep. I found this to be true. Children pee when they wake up. So as soon as you notice your child has woken up, take him/her out of the bed and put him/her on the potty. It is also good to limit their intake of fluids one hour before bed time. You can offer juicy fruits like grapes instead. And try to put them on the potty just before going to bed. My son wet his bed only 3 or 4 times overall. And he’s been diaper-free for 9 months now. Reward your child every time a drop of urine lands in the potty – clap, cheer, celebrate and feel free to give them something special. Lots of people like to give an M&M for every success. That didn’t work for us since Kamar was just 1.5 years old, but stickers did. So, we started on Monday. I did no major preparation over the weekend. Kamar woke up in the morning and instead of changing his diaper, I took it off and gave him his new undies and made a huge deal about it. Then I took him with me and we both threw the diaper to trash and said “bye bye diaper”. I also told him this was our last diaper. Silly mommy forgot to buy more. But it’s OK, because he’s a big boy now and he can go pee pee on his potty and wear big boy undies! He looked at me like I had two heads. As per the book, I was supposed to put him on the potty every hour. This absolutely did NOT work for us and actually backfired on us. My son went from not caring much about the potty to resenting the potty completely. He hated the thing and refused to sit on it. He would straighten his legs and scream hysterically. It was so frustrating. So I had to choose a different approach – I wanted him to get curious about it, so along with the books I also showed him some YouTube videos of other 1.5-year olds using a potty. He liked two of them and eventually relaxed and would sit on the potty. But only when he had to go. So in the beginning, I would just observe him and when he started peeing, I’d quickly sit him on his potty and repeat the words “pee pee” whenever he went. And then I would celebrate the whole incident (of 10% of urine landing in the potty and 90% of urine being all over the floor) with loud cheering and clapping. Then we both went to the bathroom, emptied the potty into the toilet (while still telling him what a great job he did). He flushed the toilet and we said “bye bye pee pee”. Then we washed hands and I gave him a sticker and walked him to his dresser and he was allowed to put it on the drawers. And then I went on to clean the mess. At this point, I already felt overwhelmed. I kept doing this until eventually he was excited to get the sticker, flush the toilet and say “bye bye pee pee”. But he still would not signal anything to me, so I just kept watching him and putting him on the potty when he started peeing (tip: in this stage it was easier to let him walk around the house naked from waist down). I cried at the end of the day, overwhelmed by the piles of wet towels and clothes and zero progress. I noticed a small (but HUGE) change on Wednesday. He started exhibiting signs of needing to go to the potty – he would be walking on his toes and stepping quickly from left to right foot. So whenever I noticed this, I put him on his potty and repeated the words “pee pee”. But I was able to catch just about half of them this way. At this point I was beyond frustrated and cried from constantly wiping urine from the floor, doing a lot more laundry and realizing he may never get it… But I didn’t want to give up, mostly because it would confuse him if I gave him diapers again, and frankly I couldn’t even imagine starting from scratch again. On Thursday I went to Target and got a new potty. Maybe it was the potty’s fault. It worked and he loved his new (in my eyes hideous) potty and liked to sit on it. Towards the end of the day he suddenly pointed towards the potty. OMG!! Finally! I quickly put him on it and he peed! I was so excited I wanted to scream. From that point on it was better and better. Since my son didn’t talk, he used to point at the potty at first and eventually started saying “kaka” when he needed to go (now he says “pee pee”). On Friday we ventured outside together. He had an accident, mainly because I still felt awkward about using the travel potty. I knew he had to go but just didn’t get it out quickly enough. By the end of the week we got the hang of it and I no longer felt bad about setting up his travel potty wherever we were – heck, I see dogs peeing and pooping everywhere – no one ever cleans the dog urine, and often the number twos don’t get cleaned up either (gross!). I leave no mess after my son, his pee pee is contained in the biodegradable bag which goes into a garbage can. 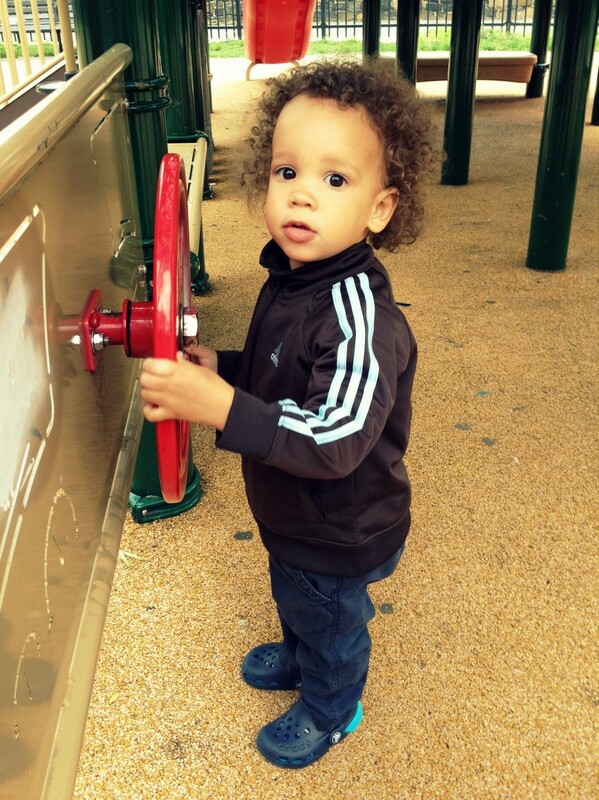 The following Monday I took my newly potty trained son to a playground wearing just undies under his pants. He had no accident and yep, we used the travel potty. This is him posing for his super proud mommy that day. I would say it took a month or so for him to be able to use the potty “on demand” – in the very beginning he did not want to go pee pee before we left the house but eventually (in about a month or so) he started using his potty when we asked him to, such as before leaving the house or before a nap or bed time. About 2 months after we started potty training we did a lot of traveling with our son – including 4 international flights (of which some were 10-hr long flights) and long bus rides and our 22-month old bud had no accident. I was (and still am) super proud of him. It was so liberating to travel without diapers. I love the diaper-free life – not only is it way easier on the wallet, it’s also the greenest way to go about diapering and the best thing for his confidence. I respect my son and his elimination needs and don’t want him to sit in his own waste 24/7 for the first 3 years of his life (which is the US average). 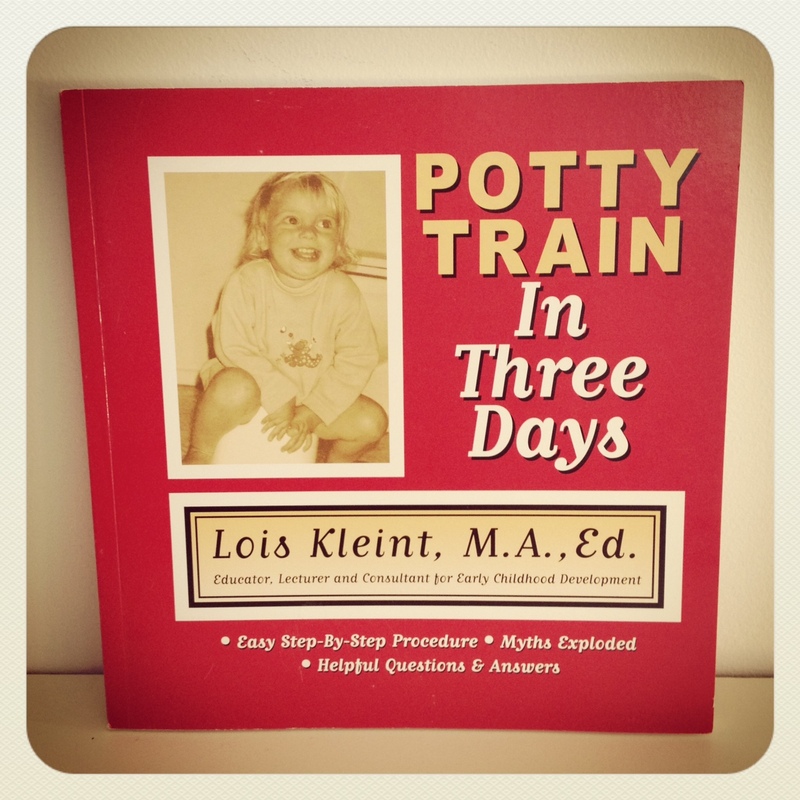 Potty training a 1-year old child is not any harder than potty training a 3-year old. Yes, they don’t speak as well or perhaps don’t speak at all (like my son) but they are not less intelligent, nor less capable to understand, and they can definitely sign. In fact, it is actually easier to potty train a younger child because with a 3-year old you are breaking a much stronger habit. The comments I see online that early potty training causes psychological or behavioral problems and delays are ridiculous. Seeing a 3-year old in diapers/pull-ups in Europe and other parts of the world is rare. That means the whole world, except for the USA, would have to be delayed and psychologically disturbed. When I was visiting my family in Europe over the summer, I paid close attention to this and didn’t see any 2-year olds in diapers. In fact, I saw even younger children than my son without diapers. I was potty trained by 16 months of age – that’s when my twin sisters were born and my mom did not want to wash and change diapers for 3 kids so she potty trained me before my sisters arrived. It caused no brain damage to me. I am fine. Nor was I delayed in school (I graduated with honors and have a Master’s in Engineering). The whole “don’t potty train your child before the age of 3” nonsense was created by money-hungry companies and profit is the only thing they care about, not your child’s well-being. Did you know business with disposable diapers is one of the most lucrative businesses ever? Of course they will tell you not to potty train your child at 1.5 and rather wait until he/she is at least 3 because they would lose half of their profit. And this “half” is a massive chunk of money. Not to mention the damage these disposable diapers cause to our planet – it is the 3rd largest single consumer item in landfills yet only 5% of the population uses them. Every day a shocking number of 50 million diapers enter the landfill, and since they are not biodegradable each one of them takes up to 500 years to break down. One day we will be surrounded by disgusting poopy diapers. If you opt for cloth diapers you are certainly relieving our landfills, however, the water and energy used to wash cloth diapers is certainly not insignificant. Remember: The greenest way to diaper is to potty train your child early. I’m potty training my 20 month old and I agree about the pull ups. We used them on day 1 and though he peed in the potty, he peed in the pull ups too. Today is day 2, and we started him with big boy underwear. We went to a friends house a 5 minute drive away, and he started off well. He peed before we left and as soon as we arrived, I set up his potty (which he decorated so he knows it was his) and sat him down. He didn’t go the first time but he did second time. I noticed that he didn’t walk over to his potty like he does at home. I had to remind him, and so he did have one accident. I didn’t make a big deal of it, just sat him on the potty and told him that that’s where he pees now. We were only there a little while, and he’s home again and training well. I think an hour or two outing is possible, maybe even a healthy part of the training process, as long as he can continue to train through it. It means being less social but I think it’s more realistic this way. Our routine isn’t interrupted so he’s learning to integrate potty breaks into his activities. Day 3 awaits! Thanks for your feedback, Leigh! I agree – everyone should find an approach that works for them. 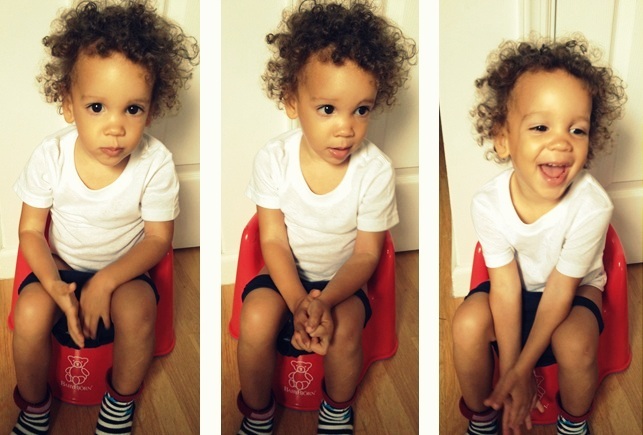 Good luck on your potty training journey and keep us updated on how things are going! Hi Cindy! I remember you! It would certainly save you money and work if you have just one child who needs diaper changes 🙂 Good luck on your potty training journey! Hi! I’m potty training my 17 month old DS and find it to be particularly challenging when she is tired. She goes from hour+ long breaks between potty breaks to nearly every 5 minutes, which leads to plenty of accidents. Wondering if you came across any such challenges, just before nap time for instance. Also wondering if you could elaborate on your night time training – what did you do, how often did your little one stir and need to use the potty during the night, tips and tricks? Thanks for your post – gave me a lot of courage to try this myself! Hi Nilu. Number 1 rule to remember: be consistent and do not give up!! The frequent peeing is normal for children in diapers as they are used to releasing whenever they want. Once the child is potty trained it slowly changes and they will learn to hold it and pee less frequently, like us grown-ups 🙂 It is frustrating, but one important thing is to not give diapers as this will slow down the learning process. Nap and night time – I just did not use diapers at all. I made sure he peed before bed time and that there was a waterproof pad on the mattress. We live in a small apartment so as soon as I heard some kind of noise of him moving, I would rush there and put him on a potty. For night time, I slept in his room for about 3 nights and when I noticed movement I put him on the potty. Eventually I moved back to my bed. It really wasn’t that bad. He had just a handful of bed-wetting accidents. I expected it to be much worse. If you co-sleep the night time will be much easier because you’ll just know your little one is up. I sometimes didn’t hear him from the other room and didn’t get there fast enough to put him on the potty. Good luck on your journey!! I just wanted to say thank you for your blog post. I’ve just begun with my 18mth DS and the first 3 days have been a nightmare. I’ve been hanging on and hoping it will begin to improve and your blog has given me some hope. I’m just not sure how to guage his readiness. We start off doing well and then afternoons are a mess. On day4 we’re doing worse than day 3 so I’m wondering if I should let him take a break or push through. He’s willing to pee in the potty and a few times he’ll let me know but other times it’ll happen wherever he’s playing. So I can’t tell. Hang in there, I know it’s so frustrating the first few days. My son was definitely not ready to most people around – he displayed no interest in the potty, he didn’t talk, nothing. The first few days were hard and it seemed as though it would never change. I remember sitting on the floor next to a huge pile of pee-soaked laundry just crying… It was mostly me catching the pee than anything else – whenever I noticed he started peeing I quickly put him on the potty and repeated the words “pee pee” and rewarded him if even one drop landed in the potty. Then the next step was that I noticed he’s about to go when he started stepping from one foot to the other so I put him on the potty before he started peeing. But then suddenly one day he got it and pointed to it and eventually he started saying the words “pee pee”. It will get better. Just keep doing what you’re doing – you’re doing great!!! Thx so much for your reply. It definitely helps knowing other mothers go through the emotional roller coaster of potty training! I’m gonna keep pushing through and hope all this works out!! Like you said in your post…I just can’t imagine doing this again with him!